John “Jack” Flatley, 90, of Lancaster, passed away on Wednesday, February 06, 2019 at St. Anne’s Retirement Community. He was the husband of Suzanne (Dean) Flatley with whom he shared 60 years of marriage. Born in Philadelphia on December 10, 1928 he was a son to the late James and Irene (Magee) Flatley. 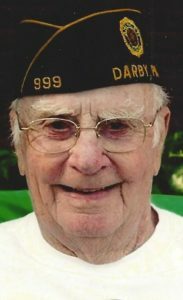 Jack served in the US Army and was a founding and lifelong member of American Legion Post 999 and Darby Firehouse #1 in Darby, PA. He retired from Boeing Helicopters in Delaware County in 1989. He then moved to Lancaster where he and Sue owned and operated O’Flaherty’s Dingeldein House B&B for 11 years. In addition to his wife, Sue he is survived by his children; Donna Sahrhage (Bill), John Flatley, Jr. (Michelle), Colleen Noel (Dan), Kevin Flatley (Michele); sister, Sr. Mary Regina Flatley; 12 grandchildren and 3 great grandchildren. He was preceded in death by his siblings, James Flatley, Jr., Rose McCormick and Hugh Flatley. There will be a funeral service on Friday, February 8 at 10 am at the Charles F. Snyder Funeral Home, 414 E. King Street, Lancaster, PA 17602. The family will receive guests from 9 am until the time of service. Burial will follow at Riverview Cemetery, Lancaster. In lieu of flowers memorial contributions may be made to: Darby Firehouse #1, P.O. Box 123, Darby, PA 19023 or by visiting: http://darbyfireco1.org. so sorry for the loss of your Dad. He will no be one of God’s Angels always watching over you all. Praying for all of you and so thankful to have had a small part in your lives. What a wonderful family and a well-loved father. Praying His peace and blessings on your all.